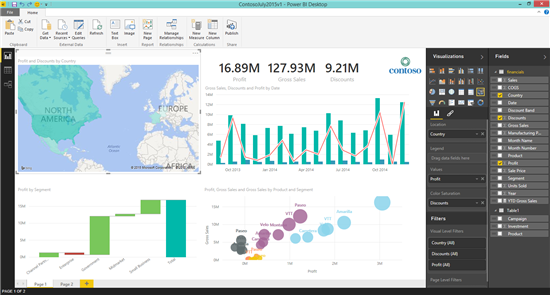 Earlier this month, James Philips Corporate Vice President of Power BI announced Power BI 2.0 General Availability on July 24. With only two days to go, now is a great time to provide more detail on some of the changes you will see on July 24 and what to expect beyond the July 24 GA.
During the preview period, we used a lot of your feedback to shape Power BI. We are committed to establishing an even tighter communication channel with our user community and using other data available for our product planning phases. The best way to provide direct feedback is via UserVoice, the Community forum and via surveys that we will be running from time to time. .
Getting ready for General availability! Team Collaboration– Enable teams to collaborate together on one set of Dashboards, Reports, and Datasets. Power BI’s collaboration capabilities leverages Office 365 Groups to provide a central location for teams to work together. You only need a Power BI Pro license for this functionality, no additional licenses are required. Organizational Content Packs – Organizations can create and publish content packs to their employees leveraging data across on-premises and cloud data sources. Power BI Trial – Any user can start a 60 day trial for the Power BI Pro capabilities. View Excel Reports in Power BI –You can now view those pixel perfect Excel Reports directly from Power BI, exactly as you would in Excel Online In the future you’ll be able to pin Excel content (e.g. PivotTables or charts) directly on your Power BI dashboard. Upload CSV Content – CSV files can now be imported into Power BI. Just like with any other data, you can build dashboards and reports on top of this data. Row Level Security support – Power BI now supports role-based, row-level security and permissions defined in on-premises Analysis Services tabular models. Share a dashboard that is connected to an on-premises AS tabular model, and your colleagues will see only the data they have access to. With the service updates, we are getting ready to also update bits of the Power BI Desktop for the GA on July 24. New visualizations including matrix, area, waterfall, and donut charts. New visualization formatting such as color setting, titles, labels, and legends. New data source support has also been extended to include Zendesk, Intuit Quickbooks Online, AppFigures, GitHub, Twilio, and SweetIQ. Direct connection to SQL Server Analysis Services tabular models for data exploration. New visualization rendering engine for the Desktop and Service. The last item on that list is not something we highlighted in the past although you may have noticed it. Let me take a moment to expand on the “New visualization rendering engine” – rendering engines are not front and center and tend not to get attention and it doesn’t show up in UserVoice voting. However it is a core area where we get a lot of indirect feedback, which we want to address. For example, we got feedback asking us to improve report and dashboard load time, increase custom visual flexibility, and improve consistency of rendering cross platforms and browsers. This all resulted in the investments in a new rendering engine. This investment now enables visual customization, expands our visual library and the ability to share our commercial grade visualizations and visualization framework with the Open-Source community. It also allowed us to benefit from the work done by the Open Source community (e.g., D3) in our own service. Last but not least, we will offer significant performance improvements that users will get to experience in the Power BI Desktop and the Power BI Service on July 24th. So what does it all mean to you ….? As with any transition to a new rendering engine, there are a few things you should be aware of, some are temporary and some are more permanent. Temporary – Not all of our existing visualizations are supported by the new rendering engine. We are still missing “Small Multiple”, “Tiles” & “Animated Bubble chart” and support will be added in a future update. More permanent – New visual layout. We took the opportunity to sharpen the appeal of our visualization. We changed colors, line styles and spacing all of which now have new defaults. We decided that making these changes at GA was the right timing. Going forward all new reports created by Power BI Desktop or reports created/edited within the Power BI Service, will use the new rendering engine. Preview users who load reports that contain visuals not currently supported by the new rendering engine can still view their reports using the older rendering engine. The implication is that loading time and visual styles will be as they are today. However, editing for those reports, will require the report to be migrated to the new rendering engine. When looking at a report, you may notice this tooltip that allows you to switch back and forth between the new and older rendering engine (when applicable). We kept both options available to users so that you can see the effect of “before and after” – this will be relevant only to reports created during the preview period. All new reports will be based on the new rendering engine. For Power BI Desktop, there is no dual mode of “old” and “new” rendering. The Desktop supports only the new rendering engine. 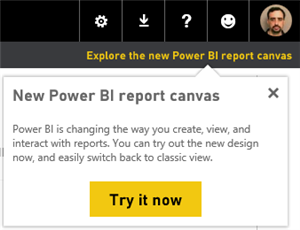 Reports will be updated to the new format as the user opens them in the Power BI Desktop. If you would like to compare with the older Designer Preview, please make sure to keep the original file around. We feel a tremendous sense of responsibility knowing that customers are betting on our offering to run their business. We also feel a great sense of satisfaction knowing we are helping our customers and partners being more successful in addressing real needs. GA is just the beginning. The pace of innovation and improvement that you’ve seen in the Desktop and Service during Preview will continue unabated. We will continue to release weekly updates for the Service and monthly updates for the Desktop. So today is really just the beginning of an already great summer.